For a quarter of a century Southern Nazarene University has thrived under the leadership of President Dr. Loren Gresham. As we celebrate this huge milestone with our fearless leader, it’s helpful to put things in perspective by looking back twenty-five years ago at what was going on in our world. Twenty-five years ago, Bart Simpson made his television debut, Taylor Swift was born and Sir Tim Berners-Lee proposed an “information management” system that would allow people to access pages hosted on computers across the globe and the world wide web came into being. 1988 was a politically active year with indictments handed down in the Iran-Contra affair, a presidential election in which George HW Bush beat out Michael Dukakis and the election of Sonny Bono as the new mayor of Palm Springs. America’s Most Wanted aired for the first time, and Steel Magnolias was a huge hit in the box office, along with The Little Mermaid, Honey I Shrunk the Kids, Rain Man, and When Harry Met Sally. The Nintendo Gameboy hit the market, and folks started using Microsoft Office and found their work routines drastically impacted by the software. Yes, right in the mix of big hair and Calvin Klein jeans, Dr. Gresham became the president of Southern Nazarene University. Although he had never really seen himself becoming the president of a university, he respected and admired the model of the Christian colleges, and he still finds them advantageous in higher education. Up until the time he was president, there had been very few presidents through all the Nazarene colleges that were not ministers. When he received the job offer, he was surprised. Point Loma Nazarene University had offered him a job, and he had only been there for 2 weeks when he was elected President of SNU. The year Dr. Gresham took office the university celebrated its 86th commencement. After graduating from college at the age of 21, he spent 10 weeks in Asia that helped shaped the person he is today and the person that we have all come to love. He had been accepted to Vanderbilt to study American History, but his time in Asia had made him reconsider his decision. He switched to the University of Southern California to study international relations, and then he went on the acquire his doctorate in Political Science at Oklahoma University. Before becoming president, Dr. Gresham had taught in the Political Science department at SNU for 22 years. Surprisingly enough, coaching basketball at SNU from 1979 to 1986 was the thing that most prepared him for his job as the president of the school. Coaching taught lessons on how to make decisions under pressure and the importance of having people in the right positions that best help the team as a whole. Our mission is to transform lives through higher education in Christ-centered community. As a Christian community of scholars, we model the hospitality of grace, the pursuit of truth, and the practice of discipleship, all within the Wesleyan-holiness tradition, as we prepare graduates who think with clarity, act with integrity, and serve with purpose. In addition to staying true to the mission statement, Dr. Gresham has strived to maintain good relationships with the Church of the Nazarene, keep a balanced institutional budget and to know as many students as possible by name. ‘Character, Culture, Christ’ is the university’s motto. Dating back as early as the 1930s, this motto has shaped and guided the university’s standards and goals. It is important to Dr. Gresham that the faculty and students know this motto, and it continues on to future generations. One of the many talents of Dr. Gresham is the ability to lead this campus, but also empowering those around him to take charge as well. When decisions need to be made, Dr. Gresham tries to hear out all sides and come to a plan that most if not everyone can agree on. When recruiting faculty, Dr. Gresham feels it is important to have people that believe in the mission statement and motto and will be examples to the students in their own personal lives. At SNU, Dr. Gresham wants the faculty and students to have a deeper relationship. He wants everyone to live their lives together and know each other on a more personal level. The students have had a drastic impact on the lives of the Gresham Family. 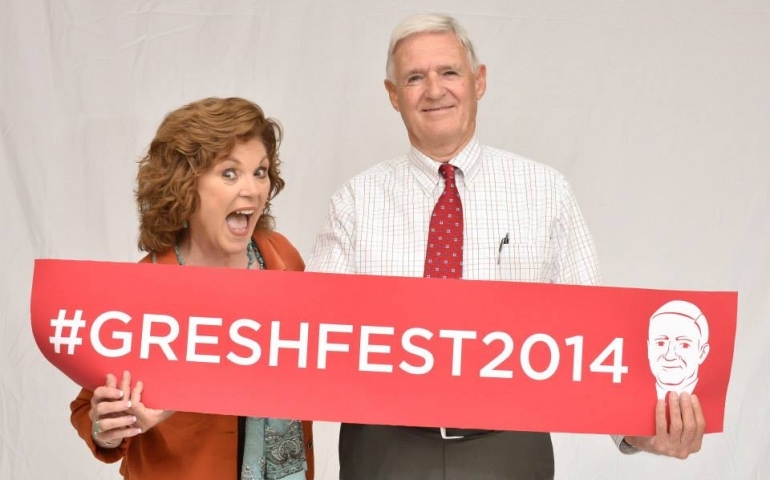 Dr. Gresham and his wife Linda are a fixture around campus and know many students by name. Dr. Gresham and Linda have been a part of the life of Southern Nazarene University for a quarter of a century, and they have certainly left their mark! Thank you for impacting so many lives and for investing so much to make Southern Nazarene University the academic mainstay it has become.